Mangaluru, Apr 20 2017: Aavsu ani Cherdu, a collection of Konkani lullabies authored by Sunita Shenoy and published by Baliga Publications was released. Baliga Publications has been bringing out Kodial Khaber (Kodial news), a Konkani fortnightly, since a decade. Author Shenoy served the state revenue department for 38 years. Her husband Late C. Vasudev Shenoy who was a lab technician by profession, had penchant for writing and wrote in Kannda and Tulu, including Tulu plays. 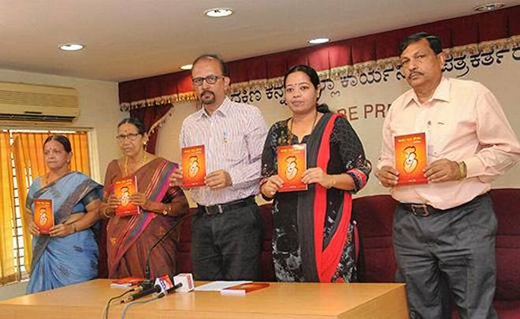 Though Late Shenoy had been urging his wife to write sensing her creative skills, she could not do so because of office occupation, Sunita Shenoy recalled during the book release. She began attending literary programmes after retirement in 2003 and started writing. Aavsu ani Cherdu comprises one hundred lullabies that could be sung at various stages of a kid’s life, she said. Hailing from a middle class joint family in Belthangady, Sunitha Shenoy brought out the poems based on her experience in the joint family.